President Petro Poroshenko and Ecumenical Patriarch Bartholomew have signed the Agreement "On Cooperation and Interaction between Ukraine and the Ecumenical Patriarchate of Constantinople". According to the president's official website, this is an agreement on cooperation in the creation of an independent Orthodox church in Ukraine. It says that the Ecumenical Patriarch provides the Tomos, recognizing the independence of the Ukrainian church, and presents it to the Primate elected by the Council. Poroshenko stressed that this day is historic for the creation of an independent Ukrainian Autocephalous Orthodox Church, as today the agreement was signed on the establishment of an independent Ukrainian Church. "The Agreement we signed today provides all the conditions for the process of preparing for the Council, the process of giving the Tomos to be brought to a strict conformity with the canons of the Orthodox Church. I congratulate you all on signing this Agreement. I want to emphasize that 3 November is a historic day for the creation of the Ukrainian Autocephalous Orthodox Church," Petro Poroshenko said. "Today is a historic day. 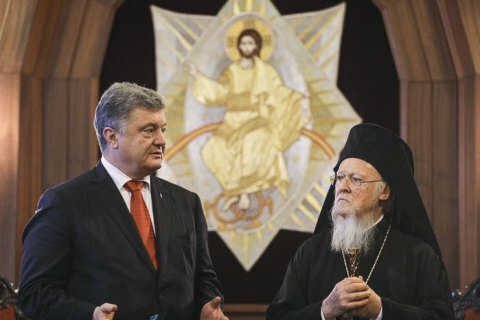 The historic day, which was initiated from the first days of the restoration of Ukraine's independence, when Ukrainians sought and prayed for the Lord to send them an independent autocephalous Ukrainian Orthodox Church," the president added. "I urge Ukrainians to pray for peace, for the unity of the Ukrainian Church. To pray that the Lord will not allow provocations strived by our enemies, will not allow bloodshed. We will do our utmost to complete the procedure of giving the Tomos to the Ukrainian Church by His All-Holiness Patriarch Bartholomew as soon as possible," he said. Ecumenical Patriarch Bartholomew emphasized that today is an important historical moment for bilateral ties and for the Orthodoxy as a whole. "We have just signed the Cooperation Agreement between the Ecumenical Patriarchate and Ukraine. This Treaty will help accelerate the provision of autocephaly to the Orthodox Church in Ukraine," Patriarch Bartholomew said. His All-Holiness emphasized: "This right to have an autocephalous Church and this desire, which you have cherished for many years, come true these days". "Just as other nations of the Balkans, who received autocephaly from the Mother Church, had this right. This is an exclusive right of the Mother Church to provide autocephaly when it deems it expedient, when all conditions are ready for this process," the Ecumenical Patriarch especially emphasized.